08 June 2007 (VietNam Net Bridge) – 20 collectors of Vietnamese antiquities showcase the best and oldest in an exhibition in Hue City for the Traditional Craft Festival. It is interesting to note that the aim of this exhibition is to provide inspiration for craft makers to produce antique-style souvenirs! For the first time, hundreds of antiques made of materials ranging from wood to gold owned by 20 collectors nationwide will be exhibited at the 2007 Hue Traditional Craft Festival that starts today, June 8. Other collectors will come to the festival with more than 30 antiques dating from the Nguyen Dynasty, Vietnamâ€™s last dynasty. Thanh Hoa province will contribute the most to the festival with nearly 200 antiques, more than 100 of which date back to the Dong Son period. 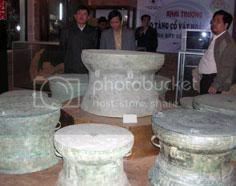 According to the organisation committee, of the collectors to participate in the upcoming festival, only collector Hoang Van Thong from Thanh Hoa has established his own private antique museum. Others have exhibited their collections at many places, but this will be their first participation in a bronze, wooden and gold antique exhibition in a festival. Read more about the Hue 2007 Traditional Craft Festival.